When you explore the luxury automotive landscape, you will find few brands that possess the sterling reputation for quality, luxury, technology and performance that is the equal of the Audi brand. An impressive inventory of luxury-infused, sport-tuned cars and crossovers promises to check all the boxes when you choose the German-engineered brand and at the heart of the Audi model lineup, you will find the Audi A5. Experience unmitigated thrills and supreme luxury at a budget-friendly price when you get behind the wheel of a used Audi A5 in Dallas, TX at Certified Autoplex. The Audi A5 is a staple of the German luxury brand that is available in sporty sedan, sleek coupe and fun convertible configurations. A spacious and luxurious cabin, makes room for five passengers with premium leather interior, ample cargo space for your day-to-day errands and a wealth of innovative technology that make life simple and safe. 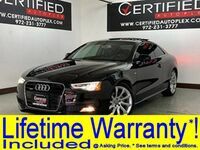 Pre-owned Audi A5 models at Certified Autoplex have the added advantage of affordable price tags, low mileage and available lifetime warranties. What are you looking for from a new-to-you luxury car? Are you drawn to powerful, fuel-efficient and turbocharged powertrains? Do you love the look and feel of premium leather interior, wood trim and chrome finish? Do innovative technology and features make the top of your car-buying wish list? 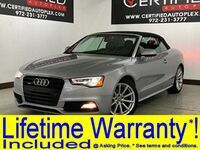 When you get behind the wheel of a used Audi A5 in Dallas, TX at Certified Autoplex, you will enjoy all of the above. Drivers who opt for the Audi A5 will enjoy the mechanical machinations of a spirited 2.0-liter turbocharged four-cylinder power core that delivers the perfect combination of power and fuel economy. An upgrade to the track-ready Audi S5 variant means the addition of a 3.0-liter turbocharged V-6 engine. When you add Audi Quattro® All-Wheel Drive to the equation, the Audi A5 delivers impressive traction, handling and acceleration. Inside the Audi A5 cabin, drivers will discover premium leather interior, an integrated Audi MMI infotainment system with a 6.5-inch touchscreen display, Bluetooth capabilities and an exceptional 10-speaker sound system. Models in stock at Certified Autoplex promise incredible value with affordable prices and next-level features that include Blind Spot Monitoring, navigation technology and much more. Interested in a Audi A5?